Having poured out his heart in words and also through his tearful eyes, Sastrigal fell at the foot of Periyava, indicating his ‘saranagathi’. Periyava was in ‘Koubeenam’ for ‘snanam’. He just took the robe back asked the sastrigal to come to the snana-kattam where he heard the plight of the Sastrigal. He is one of the most famous and one of the most senipr Sastrigals in Andhra- Sri Mandaleegam Venkata Sastrigal. 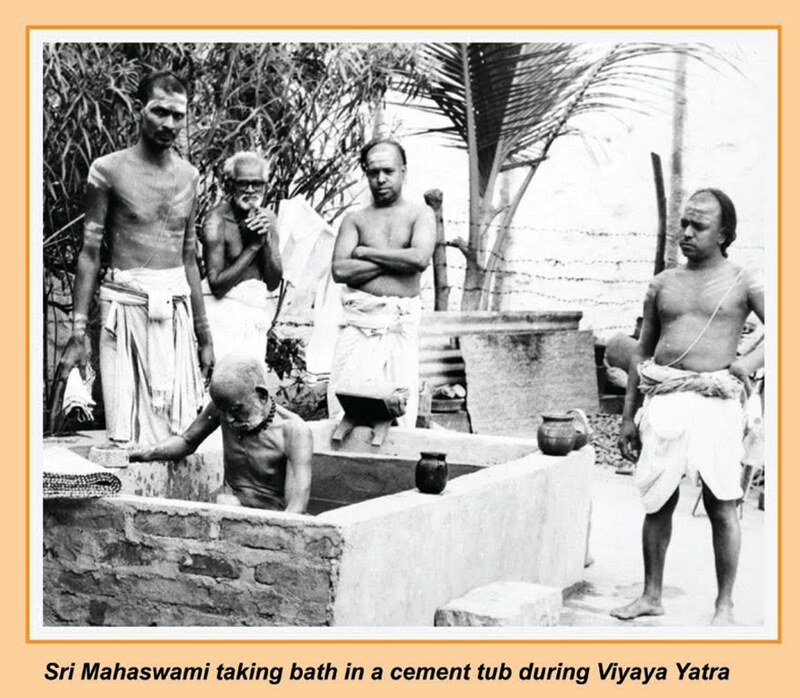 Some of the well-known sevakas of Periyava like Sri Avadhaana Swamigal later became the students of the Sastrigal. It was at Sivasthanam camp. After leaving the Sri Matam, when Periyava went on a long ‘DigVijayam’, they were at Sivasthanam. Sri Kannan Mama, Sri SriKantan Mama, Sri Thamaraipakkam Mama and Sri Sivarama Sastrigal were the only four who were allowed to be there after 6pm. No one can could go inside or talk to Periyava. Even ‘biksha’ had to be kept at the counter. Periyava may accept it. At night, Periyava may lay down there with His mouth open, like a sparrow. One of the four attendants would understand and pour couple of spoons of milk, which Periyava may accept. During that period, Periyava had surprisingly spoke to them. It was a 1-1.30 am, midnight. Asked Sri Kannan Mama and Sri Thamaraipakkam Mama to be there with Periyava and the rest were asked to retire to the bed. As such they used to pray from ‘ellai-pidaari’ all the way upto ‘Nepal-Pasupathinath’, if someone says ‘பெரியவா உத்தரவு ஆகியிருக்கு!’ (‘Periyava called you!’). Sri Srikantan Mama’s words added to the alertness. Periyava made a ‘lotus’ symbol through sign language and pointed to the eye. ‘Lotus Eyes?’. May be! But Sevaka understood that Periyava was referring to Sri Thamaraipakkam Mama and Sri Kannan Mama. Only Periyava’s Kingaras can understand HIM. Both Sri Thamaraipakkam Mama and Sri Kannan Mama were in front of Periyava. Both reported in front of Periyava, the next day. They told Periyava that they completed the reading. Now, they had to go for their lunch. Periyava asked for the book by ‘Sri Avadhaana Swamigal’. Someone rushed to the mutt in Kanchi and brought it. “கீதைல ‘சிஷ்யாளோட கைங்கர்யம் பலமா இருந்துதுனா குருவானவர் தான் மகானா இருந்தாக்கூட…தன் சரீரத்தை விட முடியாது’ அப்படீன்னு சர்ம-தசை-ல இருக்கோ? “ஹே! ஹே! ஹே!”, a casual laugh, sort of belittling, with the head moving left and right negating the statement was the response given back by Sri Mandalegam Vekata Sastrigal. “என்னமோ சுவாமிகள்…என்னத்தையோ சொல்லறார்…” (Periyava is saying something out of context) was the feeling inside. The book discussion continued… Suddenly, one day, Sastrigal came running with the eyes shedding tears…”பரமேஸ்வரா! 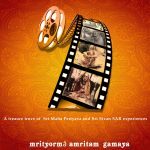 நான் அபசாரம் பண்ணிட்டேன்! நீங்கதான் ஈஸ்வரன்! உங்க வாக்கிலே வரதெல்லாம் வேதம்! எனக்கு தெரியாத… என் அகங்காரதுனால ஏதோ சொல்லிட்டேன்! He is a famous and very senior (aged) Sastrigal… Mandaleegam Venkata Sastrigal! Sastrigal was quite old but Periyava, at that time was very young. No one knew… how, when, what happened. But the learned Sastrigal seemed to have realized that Periyava is beyond comprehension!!! Sastrigal said, “நீங்க சொன்னதுதான் சரி… மதுசுதன சரஸ்வதி எழுதின ‘குதார்த்த-தீபிகை-ல இருக்கு…பெரியவா சொன்னதுதான் இருக்கு!”. All written in Telugu. (What all Periyava said is right, Madhusudhana Saraswathi’s Gudartha Deepikai has the same thing that Periyava said). On hearing this both Sri Kannan Mama and Sri Thamaraipakkam Mama broke down in tears. What a great soul mahaperiyava is.Thanks for sharing such enlightening experience.